In his desperate last-minute attempts to smear Obama in the presidential campaign, McCain is bashing his democratic opponent over pork barrel spending, including a $3 mil. "overhead projector." McCain pulled out this jab during the last Presidential Debate last week, and it's a shame Obama didn't smack him and put him in his place. So Pound360 would like to do that now. First of all, the object in question is not an overhead projector like you'd see in a class room. It's a "planetarium projection system" for Chicago's Adler Planetarium, a spokesman told NPR's Science Friday. This is a serious piece of high-tech science hardware, people. It serves as the heart of a planetarium, a place Science Friday guests referred to as the "everyman's bridge to the universe." 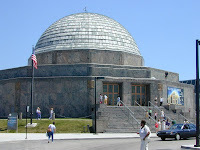 Yes, this is everyman's planetarium, not just Chicago's. Almost 60 percent of Adler visitors come from outside the state of Illinois. This is exactly what federal earmarks should be used for! To inspire the nation. Still don't care? Well, please remember that there's a science and math education crisis in this country right now. A killer planetarium is exactly the kind of thing that inspires kids to fall in love with math and science. And while McCain is attacking the Adler's renovation, the Science Friday clip reminded us that China just built an impressive planetarium in Beijing to "introduce children to the night sky." So if it's not enough to think of that $3 million as a bridge to the universe, think of it as an investment in national competitiveness. It's truly sad that a presidential candidate is incapable of thinking this way. Pound360 expects more.